You know you're never going to wear that solid yellow gold watch again! Back in the 70's and 80's everyone who was anyone was wearing a gold watch, remember nugget watches? Well, even though they are not really in style anymore, they are worth money. Back then, gold was only a couple hundred dollars per ounce so making a watch with a couple ounces of gold was not that expensive. Today a watch with 2 ounces of 14k gold is worth over $1000 just in scrap value! 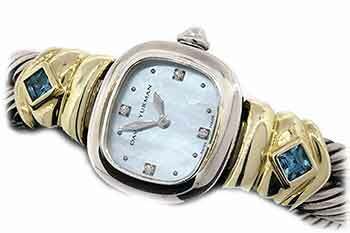 We buy any solid gold watch, even platinum watches! This model T-55709 with its Swiss Quartz movement has a case Size of 21mm wide and 19mm tall. The dial is blue mother of pearl with 3 diamond markers. The gemstones are 2 3.5mm asscher cut blue topaz. The crystal is a sapphire crystal and no scratches. The metals are sterling silver and 14k yellow gold. The bracelet is sterling silver and the watch has ~6" of interior space. The bracelet opens by flipping down the spring loaded clasp. We buy gold watches! 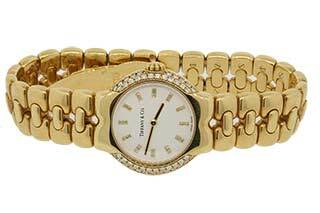 High end gold designer watches can be worth more than their weight in gold. If you have a gold Rolex watch, Tiffany & Co. diamond gold watch like the one pictured here or other high end designer watch, Cook County Buyers will likely pay well over the gold value for your watch! Some old gold watches are simply worth their weight in gold. In any case, if you want to sell a solid gold watch including white gold, and even platinum watches, you've found the right buyer! To the left you can see today's current market value for gold. Some days the price of gold will rise or fall as much as $50 per ounce. Other days it may only move one dollar or even less. 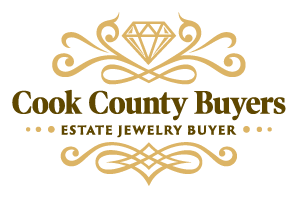 The market price of gold is always changing and Cook County Buyers stays on top of the current price to make sure you get an accurate value for your gold watch or other gold items! If you want the most for your gold watch, its TIME to call Cook County Buyers. Mike understands that you have a busy schedule. That is why it is your choice to meet one on one at the private office in Skokie, or choose a convenient location near your home or work. Feel free to call to discuss your item for sale and make an appointment today! Mike is available to meet days, evenings and weekends for your convenience. Please call (773) 490-9828 to schedule a meeting. Copyright 2019 Cook County Buyer, Inc. All Rights Reserved.